DALLAS (AP) — Among the items U.S. soldiers seized from Adolf Hitler's Bavarian Alps hideaway in the closing days of World War II were albums meticulously documenting an often forgotten Nazi crime — the massive pillaging of artwork and other cultural items as German troops marched through Europe. 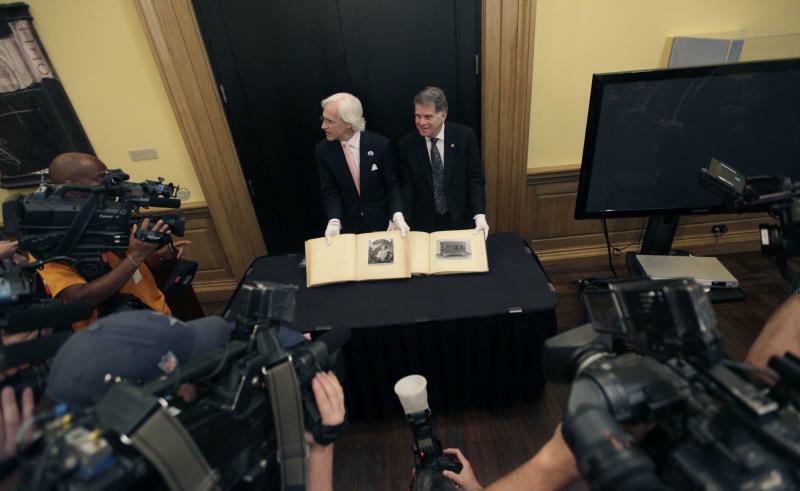 Two of those albums — one filled with photographs of works of art, the other with snapshots of furniture — were donated Tuesday to the U.S. National Archives, which now has custody of 43 albums in a set of what historians believe could be as high as 100. 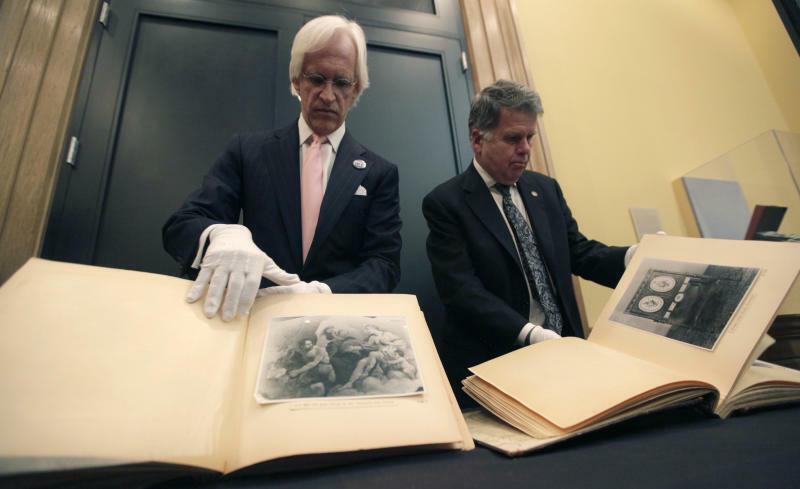 Robert M. Edsel, founder and president of the Dallas-based Monuments Men Foundation for the Preservation of Art, which announced the discovery of the two new albums at a news conference, called them "key pieces of evidence taken from a crime scene that were prized possessions of Adolf Hitler." Relatives of the two soldiers who took the albums contacted the foundation, which has previously donated two other albums in the series to the National Archives. They had read stories in the media about foundation's mission, which includes continuing the work of the Monuments Men, who helped Allied forces protect cultural treasures during World War II and helped return stolen items after the war. "We can only hope for more discoveries in the years to come," U.S. Archivist David S. Ferriero said at the news conference. The Nazi agency Einsatzstab Reichsleiter Rosenberg, or ERR, created the series of albums to document the items taken from across Europe. Of the 43 albums identified so far, 39 were discovered in May 1945 at Neuschwanstein Castle in Germany. They were then used as evidence at the Nuremberg trials to document the Nazi looting before eventually going to the National Archives. In 2007, the Monuments Men donated two additional albums after they were found in the attic of the family of a U.S. soldier, though the foundation has retained possession of one of those for the last few years as a teaching tool. "I think there's a lot more of them out there," said Edsel, who noted that the albums were used as "shopping catalogs" for Hitler to select works of art for various museums. Of the newly discovered albums, one contains photographs of 69 paintings that were taken as early as 1940. Most of those paintings appear to have been properly restituted, but an ERR database indicates four were not. The other newly found album contains photographs of 41 pieces of furniture, mostly taken from the Rothschild family. Edsel said that by 1951, the Monuments Men had processed and returned more than 5 million stolen objects. "It was the greatest treasure hunt in history — one that continues to this day," Edsel said. 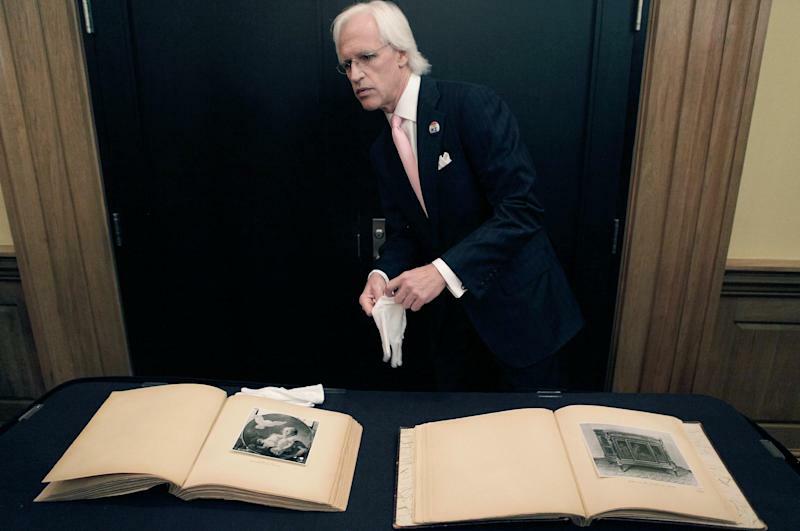 Greg Bradsher, senior archivist at the National Archives, said the recently discovered albums are a reminder of the massive amounts of property Hitler took and a reminder that "to this day, hundreds of thousands" of items are not with their rightful owners. The albums are also "a reminder that a lot of soldiers in World War II brought souvenirs home — some of them were helmets, bayonets, medals, which are really bounty of war — but others picked up books, albums, other cultural property," Bradsher said. One of the newly discovered albums, known as album 15, was taken by Pfc. Yerke Zane Larson, who served in the 501st Battalion of the 101st Airborne Division, the "Screaming Eagles." Cpl. Albert Lorenzetti, who served in the 989th Field Artillery Battalion, took the other album — known as album 7 — the same week, also from Hitler's home, called the Berghof. Both are now deceased. "When you consider what these solders went through, slogging their way through the loss of buddies, through horrible weather conditions, fighting, combat, etc., and then this momentous occasion when they had a chance to take a deep breath, go up there to the Berghof for no reason than to be able to tell their families and future generations, 'I stood where Hitler's home was,'" Edsel said. "That's what motivated the taking of these things." Larson's daughter, Sandra Runde of Rapid City, S.D., said that she can remember her father taking the album out once or twice when she was growing up. Runde said her father, who returned from the war to take a job sweeping the floors at a restaurant supply company before eventually buying it and working there till he was 80, didn't talk about the war and didn't elaborate on the album beyond saying that it was from Hitler's home. "It was just tucked away somewhere," Runde said. Runde said her father, who died on his 87th birthday in 2009, gave the album to her about five years before he died. She said she's happy that it's now somewhere safe where people can appreciate it.